Birthdays are a kind of a big deal in our house. I am a very firm believer that every moment of your birthday should be special, including breakfast. 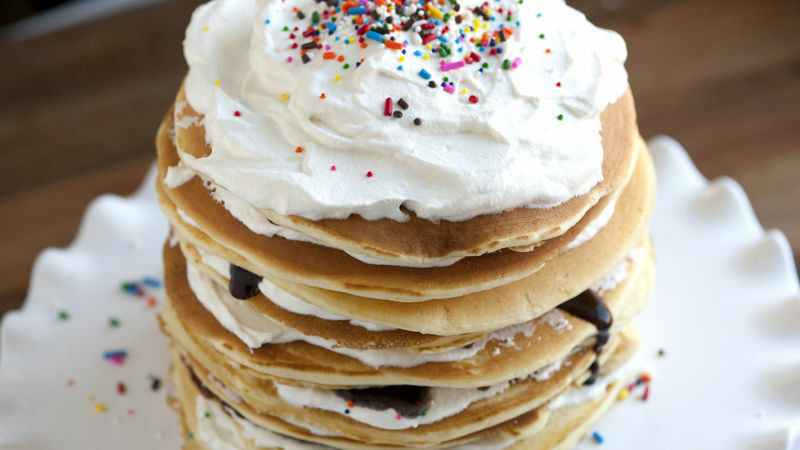 Ask my kids about the best part of their birthday and they will both shout, “cake!” Cake for breakfast would usually be a crime in my mommy rulebook, but when the cake is actually a tall stack of beautiful pancakes, I say, why not?! I’ve had so much fun creating three different birthday pancake cakes based on my family’s favorite desserts. Hands down my favorite dessert is the banana split, this Banana Split Pancake Cake is filled with whipped cream, bananas, and cherries —delivering all the best things that a banana split has to offer! My daughter’s obsession with cookies and cream ice cream is epic — we never have a doubt what flavor she’ll order at the ice cream shop. This Cookies and Cream Pancake Cake is inspired by her favorite ice cream treat. Do you love churros? My family is wild for this unique treat. This Churro Pancake Cake may not be crispy, but it tastes just like the cinnamon-sugar treat. These oh-do-delicious dessert inspired layered pancake cake recipes deliver birthday morning that will be remembered year after year. Make Pancake Cakes extra special with a personalized topper. These Printable Chalkboard Alphabet Banners are a sweet way to add some pizzazz to birthday morning pancakes. Download the full alphabet to personalize your morning greeting, or decorate birthday flapjacks with any one of these other fun DIY ideas!